Pipe the Orange Frangipane in the tart shells enough to just cover the bottom and bake. Allow to cool. Dispense the Bionda Cremeux on top of the Orange Frangipane in the tart leaving enough room to dispense the Strawberry Gelee. Allow to set in the refrigerator. 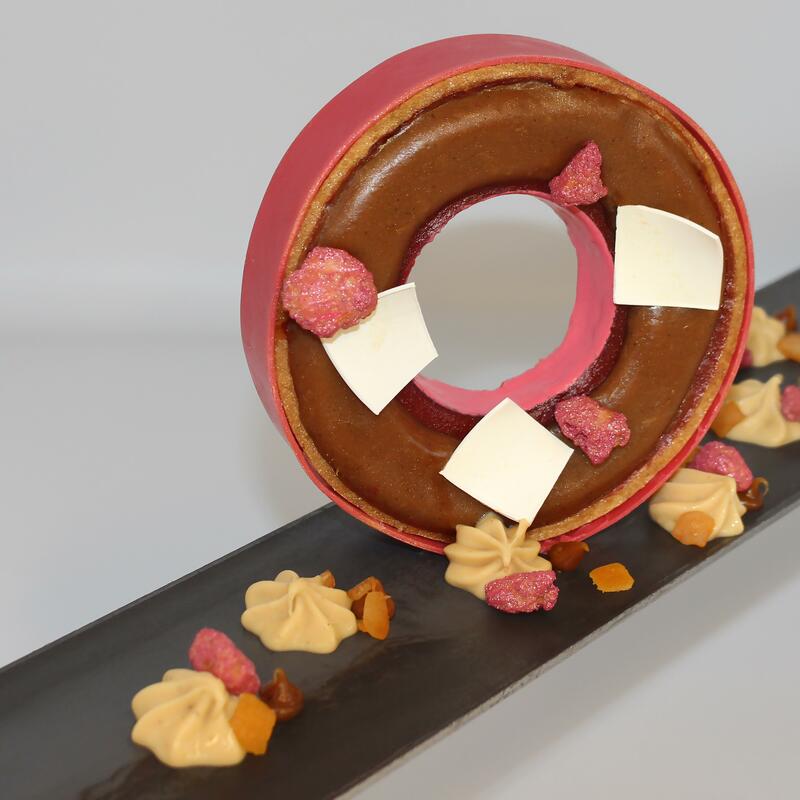 While the Bionda Cremeux is chilling, make the Caramel Filling and fill in a ring mold. Freeze for easy release. Dispense the Strawberry Gelee on top of the Bionda Cremeux. Allow to set in the fridge. Cut out the center of the completely filled tart that is fully chilled using a round cutter. Freeze until ready to assemble. Make a ring decoration with red colored Edelweiss. Make square decoration with white colored Edelweiss. Glaze the inside of the frozen tart with red colored Chocobrilliant White warmed to 95ºF/35ºC. Place the Caramel Filling ring on top of the tart and defrost. In a stand mixer fitted with a paddle attachment, cream the butter and sugar. Add the eggs one at a time, scraping after each addition, followed by the almond flour and Orange Rappe. Mix until smooth. Use as desired or bake at 350°/176°C F for 10 minutes or until golden brown. Boil the cream and the vanilla bean together. Infuse for 20 minutes. Keep warm. Place glucose and sugar in a sauce pot and cook to a dark caramel. Add the cream to the caramel in 3 steps whisking thoroughly each time. Allow to cool to 100°F/38°C then add the butter with an immersion blender. Pour the caramel into a sauce bottle. Make an anglaise with the milk, heavy cream, glucose, egg yolk, ans sugar. Strain over the Bionda and emulsify. Bloom the gelatin in ice water. In a pot combine the strawberry puree and sugar and bring to a boil then remove from the heat. Gently stir in gelatin. Stir in lemon puree.